Browse > Home / Voice of Democracy / Is it Getting Hot in Here? Our planet is getting warmer. “All but the most ignorant, biased, and skeptical now admit this truth…” (Tim Flannery, Chairman of the Copenhagen Climate Council). That’s because there’s more CO2 (carbon dioxide) and methane gases – once simply called “pollution” – in the atmosphere than ever before. Carbon is in the oil, gas , limestone and coal – all that fossilized organic matter – that we dig out of the ground. When we dig that stuff up, and when we burn it to make electricity, we release the carbon into the air. The atmospheres of Mars and Venus – planets where life does not exist – are made up mostly of CO2. In contrast, CO2 makes up only a few parts per 10,000 of Earth’s atmosphere. Carbon in the air is drawn into the earth, primarily by the oceans. The more we burn, the more CO2 results, both in the air and in the sea. CO2 and methane are the principal “greenhouse gases” that are warming our planet. 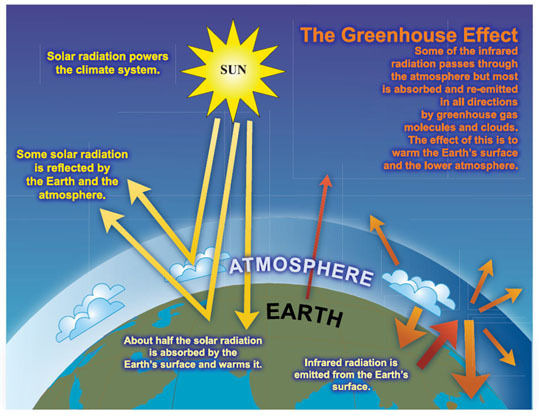 What Can Slow Down the Effect of Greenhouse Gases? There are two things which naturally slow down the rate at which greenhouse gases will warm the earth – the oceans which absorb the CO2 and the ice which currently covers about 10% of our planet. The ice reflects a lot of the sun’s heat back out into the atmosphere and also stores cold, a sort of natural refrigerator. But the ice is melting and the oceans are becoming warmer. These are facts. WARMER EARTH SEEN AS THREAT TO GRAIN PRICES – Associated Press, Dec. 2, 2010. Oh, yeah, it will affect our food supply. CLIMATE CHANGE’S THREAT TO THE FLORIDA ECONOMY – St. Petersburg Times, Jan. 19, 2011. Oh, yeah, it will affect our economy. Maybe we really should use less coal, oil and gas.